The Sylva Leader was the Successor of the similarly styled Sylva Star. Updated with an all fibreglass body the Leader was based around Vauxhall Viva or Chevette running gear with various engine options ranging from Vauxhall, Ford and Fiat 4 pot offerings. 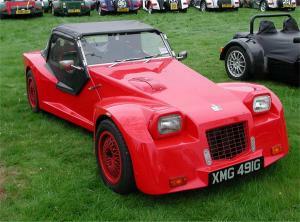 Jeremy Philips was the designer of the Leader and is well respected within the kit car industry. You can pretty much gaurantee top quality engineering, design and finish with any of his products. The Leader was no exception, well engineered and a very pleasant design. The Leader was up against the likes of the Dutton Phaeton and Dutton Melos but still managed to notch up well over 100 sales. Although Dutton won on price the Leader was the far superior car in engineering and quality terms. The Leader later passed to Swindon Sports Cars in 1985 and stayed in production until the early 1990's.